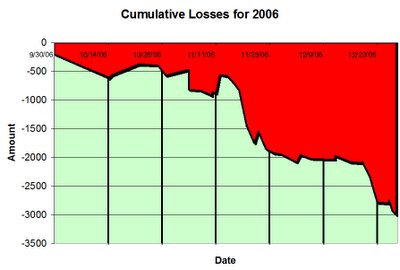 Here is a Cumulative Chart with each session in 2006 mapped out. In total, I played 41 sessions in 2006. 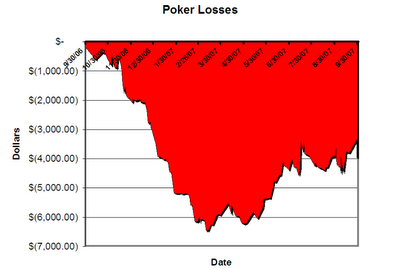 That is about 1 in 3 days playing poker or about 34% of the days in 2006 playing the game. 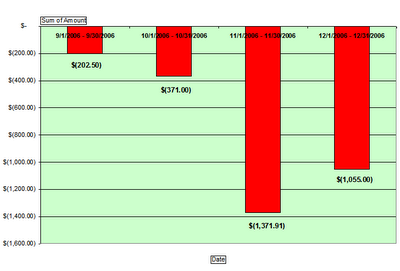 My average loss per session is about $73.18 per session. As you can see I lost allot early on learning the game. I was stuck at close to $3000 by the end of the year. Today I venture to Motor City Casino and try my new acquired hobby of Texas Hold'em. As it turned out it was the start of an expensive lesson in the world of poker. Below is my cumulative results for my first year at poker. I proceed to lose today and my losses continued to over $6K during the next six months, but I slowly been making my way back to even after one year of play. It is the end of the Golfing season in Michigan and my friend Frank and I decided to head north for the weekend for a few rounds before the season ends. We were very close to Soaring Eagle Casino. I always wanted to try my luck with Poker, so we went and I had my first experience at the poker table.